ORIGINAL TRADE PAPERBACK #3 in the Balanced Sword epic fantasy series, and series finale. 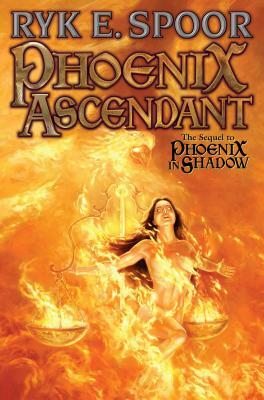 Phoenix and her companions take on the King of All Hells in a final showdown with the fate of multiple worlds in the balance. Kyri, Tobimar, and Poplock had managed--barely--to thwart the plans of the mad alchemist-mage Master Wieran, and defeat the monstrous Elderwyrm Sanamaveridion, saving the secret country of Kaizatenzei from the evil hidden at its core. Now they believe they have discovered the true architect of not just the fall of the Justiciars of Myrionar--god of Justice and Vengeance--but the unleashing of the forces of the Hells themselves against the other countries of Zarathan. They begin their journey back to Kyri's home, Evanwyl, to confront the being their new ally Miri calls Viedraverion, first son of the King of All Hells. Yet Kyri and her allies have a hidden strength themselves. They are fighting for the right, and there are ancient gods and powers who may come to the aid of a true warrior's heart in the time of greatest need. Ryk E. Spoor, while earning his masters degree in Pittsburgh, became a playtesting consultant and writer for the Wizards of the Coast, the leading publisher of role-playing games and related novels. He now lives in East Greenbush, NY, working as a technical proposal writer for a high-tech R&D firm, and spending his non-writer time with his wife and sons. Spoor is the coauthor with New York Times best seller Eric Flint, of the popular Threshold series of science fiction novels. Spoor's solo novels for Baen include Paradigms Lost, Grand Central Arena, and Spheres of Influence. He is also the author of epic fantasy Phoenix Rising.